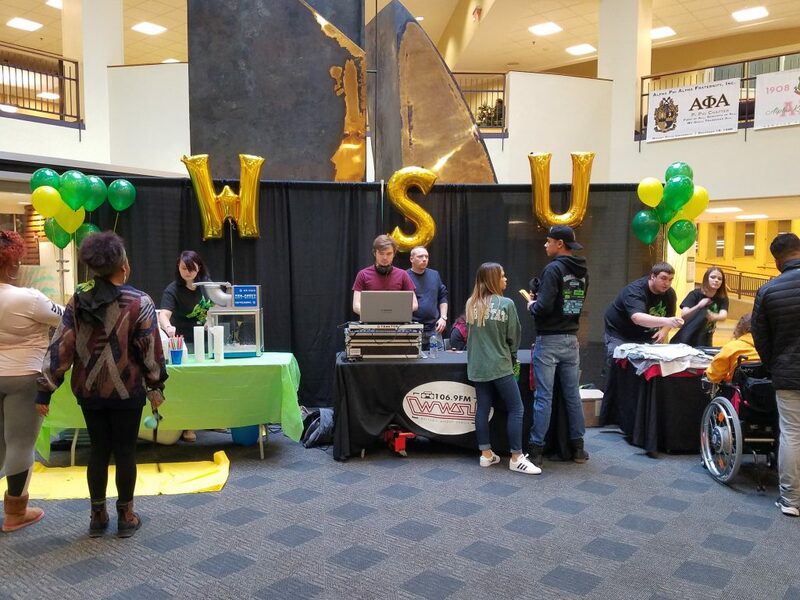 “iHeart WSU” Kickoff, Student Union SP 2019. Photograph: Michael Krieger/The Guardian. Starting Monday, Feb. 11, the University Activities Board (UAB) will present this year’s WSU Spirit Week, iHeartWSU. This is a week filled with fun events, free food and free WSU merchandise. Free snow cones and an interactive inflatable will be available, as well as Wax Hands. “You dip your hands in wax and you get to keep your hand figurines,” said Thibaut. Exchange your t-shirts in the Student Union Atrium from 12-3p.m. iHeartWSU week’s final event is a collaboration with Raider Roundup on Friday, Feb. 15 at 7:30 p.m. There will be a big pep rally before the Northern Kentucky basketball game, complete with free food, inflatables, face painting, giveaways, raffles and sign-making. Don’t miss out on WSU’s Spirit Week!